Mothers' Day Special! Roll back the years as The Lift facial mask does for your face and neck and decolletage what Eyesential does for the eyes. Do you want to share the secret behind celebrity’s flawless and smooth skin with your valued clients? Make-up artists all over the world have been creating flawless, beautiful and camera-ready skin for Hollywood celebrities such as Madonna, Sarah Jessica-Parker and Cindy Crawford. Now you too can look picture-perfect with The Lift Mini-Lifting System. The Lift Professional from the makers of Eyesential gives instant results and a fresh, younger and more radiant complexion. 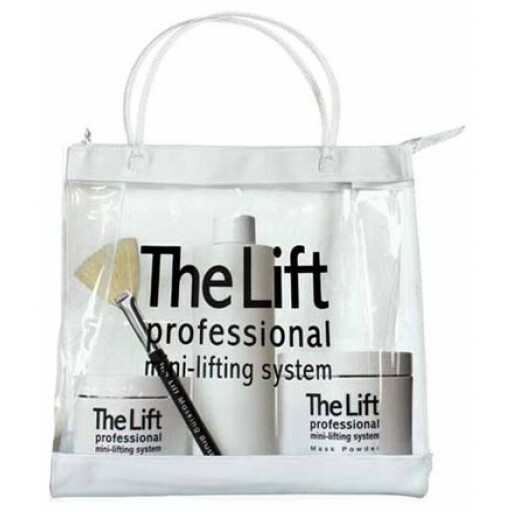 As a safe and affordable alternative to cosmetic surgery, The Lift The Lift blends fruit extracts, vitamins, minerals and enzymes to stimulate circulation and increase blood supply, resulting in noticeably firmer skin. Results are dramatic and will last for up to 7 days. What's more, these incredible results will only get better with every use. For years women have been searching for something that provides a powerful force in anti-ageing without the need for surgery. 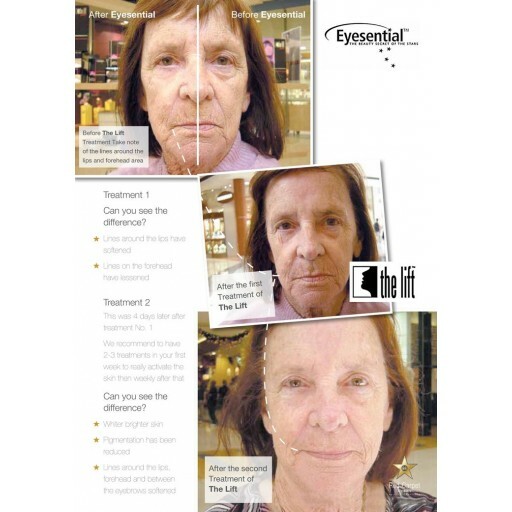 The solution: Eyesential and The Lift, two miracle products that do more to turn back the ravages of time than anything else available today. Randy Houston Mercer, one of Hollywood's top make up artists says " Eyesential & The Lift are two essential products to transform you in an instant, making you look years younger & brighter in minutes". Randy regularly uses EYESENTIAL and THE LIFT and says it is his secret weapon when working on his celebrity clientele. Dramatic results can be seen after just one application, giving you noticeably lifted firmer younger looking skin. Do non-surgical face-lifts work? Yes ! Harpers & Queen "Expect to lose five years" The Lift Petite has been used professionally by leading make-up artists to the stars for many years. Its a mask of mineral powders and enzyme boosters which works by stimulting circulation and increasing blood supply to help restore muscle tone. Finally a PH balancing moisture is applied. Results; Noticeably lifted and firmer skin. Vogue " can you really look younger in minutes? our tester was impressed with the results. Very easy to use, a teaspoon of the liquid booster and a teaspoon of mask powder are mixed together creating a light paste. This should then be applied to the face and neck in upward and outward strokes using the brush applicator provided. The Lift will begin to harden and draw the skin into an ‘extra-firm’ mask. Once the mask has hardened, it is rinsed it off with warm water using gentle circular movements. The Lift is then completed with a rich collagen cream applied topically, to replace depleted collagen supplies and encourage the renewal of the bodies’ natural collagen stores. 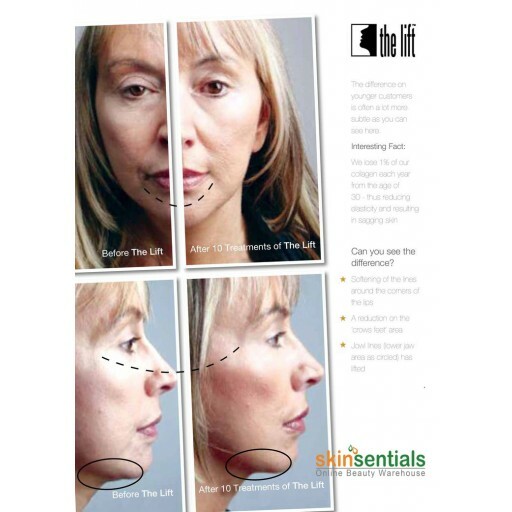 The Lift Professional contains 50 treatments for the face and neck. Water, Glycerine, Triethanolamine, Carbomer, Paraben, Methylparaben, Propylene Glycol & Papaya Fruit Extract, Allantoin, Algae Extract & Sorbitol. Corn Starch, Albumen, Methylparaben, Silica, Whole Dry Milk, Panthenol, Allantoin. Water, Propylene Glycol, Stearic Acid, Caprylic/Capric Triglyceride, Cetyl Alcohol, Triethanolamine, Octyl Methoxycinnamate, Magnesium Aluminium Silicate, Stearyl Alcohol, Dimethicone, Methylparaben, Fragrance, Collagen, Paraben, Sesame Oil, Propylparaben, Disodium EDTA, Wheatgerm Oil, rice Bran Oil, Allantoin, Lemon Fruit Extract, Horsetail Extract, Linden Extract, Calendula Extract, Matricaria Extract. This salon-quality treatment is safe and suitable for home use. From the first application of The Lift™ facial mask there will be noticeable results, but to maximise the effect it is recommended that the mask should be used twice within the first week. 2. Apply to thoroughly cleansed skin using the supplied brush to face and neck in upward and outward strokes following the order in the diagram supplied with the product. Avoid the eye and lip area. 3. Avoid any facial movements as the product dries, leave for between 8 to 30 mins depending on the firmness of lift required. The mask will dry and you will experience a tightening sensation followed by a light pulsing feeling as the toning process begins. 4. After the required time moisten the mask with a hot flannel over the face and remove with the flannel or a wet sponge. 5. To complete apply The LIft Finishing Creme in upward and outward strokes. Thank you for your question. The instructions for the Lift Professional are quite simple: mix a teaspoon of liquid booster and mask powder together, which creates a light paste. Then using the fan brush provided with your package, coat your face in upward and outward strokes starting from the base of the neck. The combination of papaya, algae extract and cornstarch gently exfoliates and develops into a tight mask, which you should wear for eight to 30 minutes. Following that, gently "melt" the mask with a warm, damp cloth (or with the sponges provided). I have recently purchased the Mini -Lifting System and I love it!! I was just wondering what the 2 white patches in the pack are used for? Thank you. It’s great. It really works. After using it for a few months it would be difficult to imagine life without it. This product is by far the best thing I have ever used. It feels horrible the first time you use it as it tightens and dries but once you get used to the feeling it's actually quite relaxing. You see immediate results. Skin looks smoother and fine lines are reduced. I was using it once a month when I first purchased it in the sachets but in the bulk containers I feel I can afford to use it at least once a week, sometimes more. I have even noticed a reduction in blackheads and pimples as a result of using the mask regularly. I would recommend using the finishing center, followed by a good quality night cream to get some extra moisture into your skin, just because sometimes I tend to feel a little dry after using the mask. 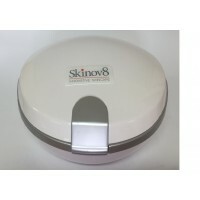 My skin is sensitive to eczema, dryness and also breakouts of acne but I have never had any issues that I would associate with using the lift. I actually think the lift helps keep my skin conditions under control. I highly recommend this product. Words honestly cannot Express hope impressed I am with the lift. My friend gave me a few treatment as she didn't like it but I love the mini lift, as long as i make sure i use it once a week i can see results. strongly recommend trying it. I've used this product for a couple of years now and love it. Those who don't know me always under guess my age which makes me feel great. So easy to use, doesn't take long and my skin feels lovely and firm. The fact that I can do this treatment in my own home, at my leisure far outweighs the cost and inconvenience of going to a beauty salon. Highly recommend, follow the instructions and do at least 2 treatments in the first week to get the full benefits. Love, love, love it! I have used The Lift Professional Mini-Lifting System for years and I simply could not live without it. I am almost 60 and nobody believes it. Except for close friends who know my age most people think I am younger. I even had someone say to me last week "you'll see when you turn 50" and they were flabbergasted when I told them that I will be 60 in a few months. The cost per treatment beats what you would pay for facials at any salon. As a matter of fact I learnt about this product from a beautician who was charging me an arm and a leg so I was glad to discover that you can get this product and have your beauty facial at home for a fraction of the cost. Strongly recommended! I bought this from a stand at our local show in June. The results really are good. You have to use it twice in the frst week-and I immediatly notice a better skin tone and softening wrinkles. Then every week after that. I've used it for 2 months now every week and peope often think that my daughter (35) and I are sisters. (I am 61) it seems a lot to pay initially,but for a product that works its worth it. There is enough in this pack for about a year. You only need a small amount-one teaspoonfull of the liquid and powder mixed together and brushed over the neck and face. (clear instructions are in the pack) Neck results are very good. I also had quite deep lines between my eyes and running down from the corners of my mouth which have all nearky disappeared now! I really can't recommend this product highly enough. Was so disappointed that this product did not work as as promoted. The texture of my skin did feel smooth but did not minimise the appearance of lines/wrinkles at all and found the finishing cream left my skin feeling dry and crying out for moisture and I had to add additional moisturiser. There were not enough instructions advising how often the finishing creme should be used, once/twice daily or only after treatment. Found Eyesentials Under Eye Enhancer excellent but cannot say the same for the Lift. Thank you so much for your review. Please note that you need to use the Lift 2-3 time in the first week, then once every week afterwards in order to get the best results. We also recommend that you use a Vitamin C and/or Retinol serum after washing off the mask and before applying the cream. We sincerely hope that after following these guidelines you will be better satisfied with our purchase.